Personalized Yeti Ramblers, RTIC Tumblers, SIC Cups, Polar Camel Travel Mugs and Ozark Trail Tumblers are laser engraved with a permanent, durable mark. Choose classic silver or a rainbow of powder coated color options. Need it in a hurry? Add Rush Processing services! It's completely FREE to customize our wedding favors or engagement party favors with your personalized info! We are a proud retailer of the Premier line of Gifts and Awards. You'll find everything from crystal golf awards to flashlights to bamboo spoons. Simply note the item # and fill out the form at the bottom of the page to get more info. Magnetic awards, paperweights, plaques, crescents, standup awards with metal frames. Marble, rainbow, and patriotic designs too! 24-hour turnaround on all in-stock legend plate colors! Search our interactive online catalog to find just your thing. Whether you need a wine-o-saur or a fleur-de-lis, we have it! Looking for custom laser engraving services for hire near Wichita, KS? Check out our capabilities! Please judge our wood books by their covers. We make ordering electrical panel labels easy! We can cut acrylic plastic, acrylic glass, Lucite, Plexiglass, & PMMA. We cannot cut polycarbonate or Lexan. You do? We do too! Check out our laser-cut acrylic mirror wedding cake toppers! We offer many services that aren't listed on our website. Just request a custom order. Celebrate with etched wine glasses! Select from more than 600 personalizable designs in our searchable online catalog. lets you put your message in stone. Literally. Looking for a unique gift for father's day or the hard-to-buy for guy? You just NAILED IT with our laser engraved hammers. Wow your gift recipients with our out-of-the-box party favor and wedding favor packaging. Rubber - Great for rubber stamps. We can only cut/engrave rubber we supply. 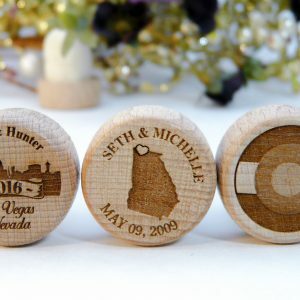 Our adorable personalized custom rubber stamps are an inexpensive way to brand your wedding stationery and gifts with your unique logo. Many plastics are not safe to laser cut/engrave because they emit toxic, corrosive chemicals when burned. We require a MSDS for unknown customer-supplied plastics. Will it fit in our machine? Better things come in bigger packages. Did you know we offer RUSH DELIVERY on most items? What is the precision tolerance? We use a laser with a very narrow focal length. The kerf, or area burned away by the laser, is around 0.006". Our parts are near that tolerance. If you need something with less tolerance, we can adjust cut paths to make the tolerance closer to 0.002"
Silhouettes of your favorite state (or country) with a heart on the city of your choice. Let us know if you need something not pictured.